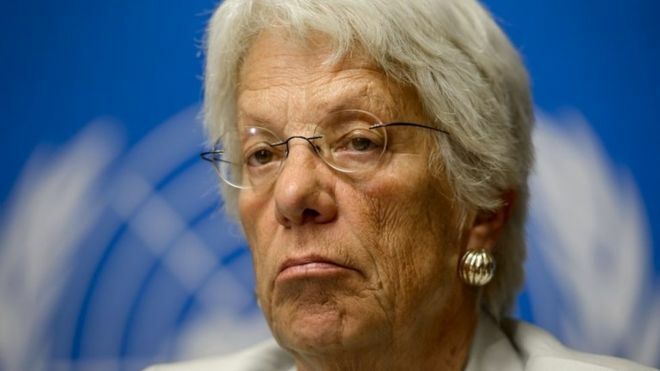 Seasoned war crimes investigator Carla Del Ponte Monday told the UN human rights council that she decided to resign from the Commission of Inquiry because of an unacceptable impunity enjoyed by warring factions in the Syrian conflict. The former ex-Yugoslavia and Rwanda war crimes prosecutor last month indicated that she was resigning from the Commission of Inquiry (COI) for Syria arguing that the UN Security Council has never wanted to refer the Syrian case to the International Criminal Court (ICC) or open a court to try criminals in the Syrian conflict, which is going on since March 2011. In her farewell address to the council, the former Swiss attorney general spoke vocally about the total impunity witnessed despite the war crimes committed by Syrian President Bashar al-Assad and the opposition. “I resign to put an end to my frustration,” she said. “Seven years of crimes in Syria and total impunity. That is not acceptable,” she added. The commission has issued several reports but never got access to Syria. They only relied on photos, interviews, testimonies, documents and medical reports. In August, Carla Del Ponte said all sides in the conflict were on the wrong side. “Everyone in Syria is on the bad side. The Assad government has perpetrated horrible crimes against humanity and used chemical weapons. And the opposition is now made up of extremists and terrorists,” Del Ponte said. About 400,000 people have been killed since the beginning of the conflict, and millions joined the ranks of refugees. Russia early this month blocked a UN report, which lambasted the Bashar side for crimes committed by the Syrian army and its allies, including Iran and Russia. Russia’s UN envoy Alexey Goltyaev accused the commission of being biased as it overlooked war crimes committed by the US and its allies who seek, he had said, to ouster the embattled Syrian President. Written by: KanelkaTagba on September 19, 2017. Posted by KanelkaTagba on Sep 19 2017. Filed under Headlines, World News. You can follow any responses to this entry through the RSS 2.0. Both comments and pings are currently closed.